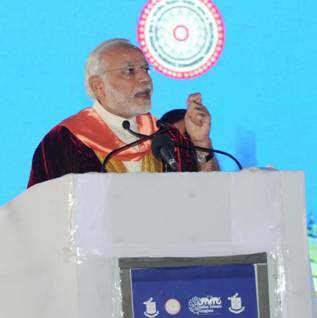 Prime Minister Shri Narendra Modi has emphasized the need to bridge the gap between Science and indigenous growth aspirations. He was speaking to the august gathering of Nobel Laureates, Scientists and delegates across the world at the Inauguration of 103rd Indian Science Congress at the Mysore University today. He stressed that innovation in approach is not just the obligation of the government, but also the responsibility of the private sector and the academia. It was the time of a new awakening in India which sought not just freedom, but also human advancement in India. He drew the attention of the delegates towards the one of the biggest challenges for the world, and one that dominated global attention last year which is to define a path to a more prosperous future for our world and a more sustainable future for our planet. We were consistent in our message that it is not enough to speak of targets and restraints but it is essential to find solutions that help us easy transition to a future of clean energy said the Prime Minister. For this, he stressed on 3 A’s available, accessible and affordable for all. Prime minister suggested for the network of 30-40 universities and labs focusing for next ten years on transforming the way we produce, distribute and consume energy which he said he will also pursue in G 20. This is especially critical for India to achieve target of adding 175 GW of renewable generation by 2022. He called to employ fossil fuel for more efficient use and tap newer sources of renewable energy like ocean waves to geo thermal. Shri Modi said that that Government intends to integrate science and technology into choices that it makes and strategies that it pursues. Calling the present century as ‘Urban Century’, as by the middle of this century two thirds of world’s population would live in the cities, he said that studies suggest that nearly 40% of the global urban population lives in informal settlements, or slums, where they face a range of health and nutritional challenges. That is why I have placed so much emphasis on smart cities, the Prime Minister added. He called upon the scientists to be concerned of what he called as Five E s at the centre of their enquiry and engineering: Economy, Environment, Energy, Empathy and Equity. This year marks a hundred years of a significant moment in the history of science, when Albert Einstein published in 1916 “The Foundation of the General Theory of Relativity”. Today, we must recall the humanism that defined his thought: “Concern for man himself and his fate must always form the chief interest of all technical endeavors. “ He called upon everyone whether we are in public life, or we are private citizens, and whether we are in business or explore science to leave the planet in a better state for our future generations. Let the different disciplines of science, technology and engineering unite behind this common purpose. The Union Minister for Science and Technology and Earth Sciences Dr. Harsha Vardhan has said that India has made substantial progress in the field of science and technology and we only have to endeavour to take fruits of such progress to the people. Speaking at the inaugural ceremony of the 103rd Indian Science Congress at Mysore today he said that India need not look towards western world for its scientific requirements. He said India made substantial progress in the fields of biotechnology, nanotechnology and in space sector. The Minister while pointing out that a substantial progress has been made in the field of vaccination development said that rotavirus vaccine has been developed in the country at a fraction of the cost as it is now available in the international market. He also said that a cheaper medicine for diabetics – BGR-34 is also to be launched through technology transfer from the CSIR labs. The Governor of Karnataka, Shri Vajubhai Rudabhai Vala, Chief Minister of Karnataka, Shri Siddaramaiah, the Union Minister of Science and Technology and Earth Sciences Dr. Harsh Vardhan, the Union Minister of State for Science and Technology and Earth Sciences, Shri. Y.S. Chowdary, General President Indian Science Congress Association Dr. Ashok Kumar Saxena, and Vice – Chancellor of the Mysore University and Organizing Chairman of the Science Congress Prof. K.S. Rangappa, Bharat Ratna Dr.C.N.R.Rao the Union Minister for Chemicals and Fertilisers Shri Anantha Kumar, the Union Minister of Law and Justice Shri D.V.Sadananda Gowda, the Union Minister of State for Heavy Industries and Public Enterprises, Shri G.M.Siddeswara, nobel laureates were among several luminaries who attended the inaugural ceremony of the Science Congress to be held from 3rd to 7th January, 2016. Later delivering the Bharat Ratna Sir M.Visvesvaraya lecture on ‘Doing Science in India’ Bharat Ratna Dr.C.N.R.Rao called upon the scientists to work with passion. Speaking upon importance of time Prof. Rao went back to PM Modi’s speech where he spoke of India in 2030. Prof. Rao said that, the preparation should begin soon and the works should be done. If we do not understand the value of time, we will never be serious about our works. We have to work in a hurry. If we do that, we will be in the top of the world in next 10-15 years.